After some discussion, I asked if they would be willing to answer a few reader questions. They were more than happy to oblige and so now I'm offering up the opportunity to you guys. What do you want to know about the movie? If you've got a question about the movie, leave it here as a comment or email me directly. I'll collect them all through this Wednesday, 6PM EST and turn them over to the Ultramarine guys. I know, I know, that's not long... so don't drag your feet. They'll do their best to answer them and I'll post all their responses this coming Monday. They might even toss in a few extra tidbits for us, but no promises. UPDATE: Thank you everyone for the questions, they've been sent off to the powers that be to be answered. I'll be posting the results this coming Monday at some point. Here are the answers to all the questions posed. Looking forward to my preorder arriving. Do they have a distributor yet for the normal release? I asked them a question myself and was told to stop asking questions. I'm curious if the trailer is a low-res render... I've seen better texturing and motion in college students final projects. Is it availible for a limited time? 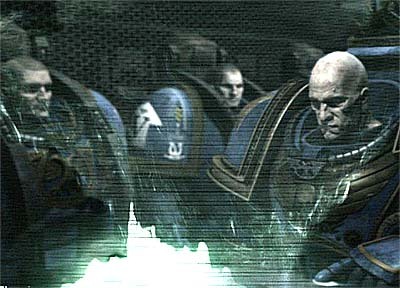 What space marine chapters appear in the film? any traitor leigons besides black leigon? did they have all the voiceactors in mind before the project started, or were auditions needed. Are there tentative plans on doing more CGI films based on the Wrahammer 40,000 universe? Do they have any plans on doing a CGI film based on Warhammer Fantasy Battle? GW has been approached by film makers for years and they have always turned them down. Why now and why Codex pictures? Good stuff folks, I'm collecting these and all the emails I've gotten so far into one list to send off. if you've got any more, send them along before tomorrow evening! Has the response/pre-orders for the movie met their expectations? How critical will the "general" launch in Spring 2011 be to measuring the overall (financial) success of the movie? If there are plans for future movies, what would be estimated development/production time? I'm looking forward to seeing the Tyranids mentioned in the verbal description of the movie. My question would be, are there any other alien races in this movie? i.e. easter eggs to look out for. Maybe some Necrons on a view screen somewhere. Follow up question would be what alien races would they like to do in future movies? Are they concerned about illegal sharing and distribution? If this is successful, would they consider doing more movies with bigger budgets? Is there a possibility of there ever being a full motion picture release of a 40k movie to the big screen? Would they ever do a movie based off one of the Black Library's many books instead of an original screenplay? I would like to know the challenges of animating power armor, especially in terms of trying to model a realistic human anatomy in there somewhere. Did anything need a "redesign" to make it able to be animated?